Take a second to think. What do you really want? Many times we'll find that what we want is actually something that we feel is "missing." When we feel like something is missing in our lives we crave a variety of solutions that may not be the solution to get you where you want to go. The sooner you find out what these things are, the sooner you can understand and fill that gap with the the right things. If we can avoid or at least minimize missteps along the way we can get there quicker and maybe even redeem our time a bit. Make a quick list of what you feel like you are missing. Write these things down. This could be anything from a car to a mindset. Maybe it's a relationship, health or a feeling. Maybe it's several things. Take time to brainstorm as big of list as you can. Set a timer for 10 minutes and stay in a focused brainstorm mode until it goes off. If you run out of ideas 3 minutes in, stay in this thoughtful mode and milk it out for the full 10 minutes. Trust me... stuff will pop into your head. In addition, your going to find things popping into your head later on as well. When it happens, get them on your list! Once you have your list, narrow down the top 3 items for the next section. Good communication with my spouse. A bachelor's degree in my field. What would change if I had these things? Answer the question... "What would change in my life if I had these things?" Taking your list of 3 things missing, write a quick paragraph on what would change in your life if you had these things. Take a moment and thoughtfully think this through. Give yourself 5 minutes on each item. Set your timer! 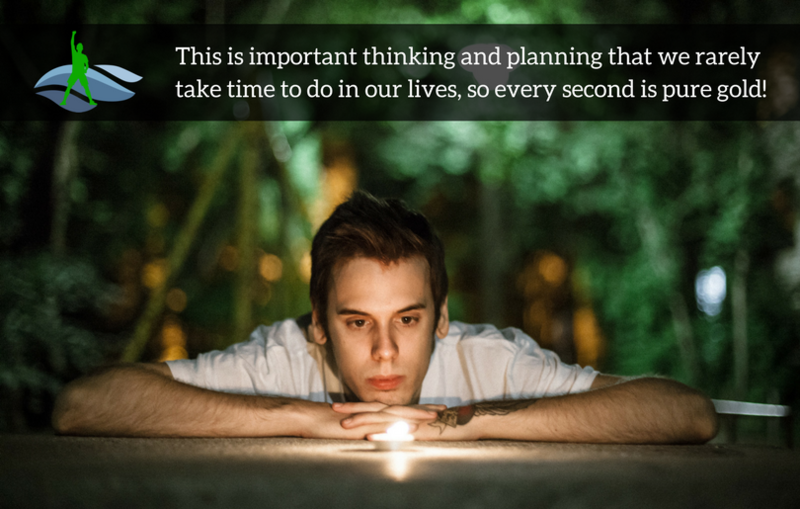 This is important thinking and planning that we rarely take time to do in our lives, so every second is pure gold! The best ideas surface as we spend time in this thoughtful posture. It's a bit foreign in our culture to proactively think through the details of our lives. We have been taught to be 'responsive' and quickly move from thought to thought, but there is a good chance this is the reason you are not fulfilled and looking to better your circumstances. Brainstorm as many details pertaining to what would really change. Remember that in brainstorming, there is nothing too big, too crazy or too far away. If it comes to mind, get it detailed on the page. My cool cloths would fit. I would be so much more confident. I'd be ready for that interview, for sure! Oof! A little more relaxed when talking about the big things. Their trust would be much more deeper. We could do more things together. What is in the gap? You know where you want to go. If you spent some time on that last step, you probably have a much more clear picture of what you really want. Now let's take a look at the last question. "What is in the gap?" Another way to say it is, "how do I get there?" This is another opportunity to brainstorm. You won't have all the answers but detail what you know about 'how to get there' for each item. What would you need to do to achieve the change you want? Then, to keep yourself honest, yet thorough, detail what you 'think' and 'feel' you don't know. This is not the time to chicken out. :-) Once you have your 'What's Missing' list and your 'What Would Change' list, write the 'What's In The Gap' paragraphs, pretending you are doing it for a friend and not yourself. You can't completely fool yourself but it may help you relax and dig into the details. What do I want my mindset to be during this time? "I can do this, because I get to pick who I am." What is more important than this? Nothing! As I approach dinner, I get real nervous about what I'm going to eat. If I plan my meal maybe that will help me relax. What should I remind myself when I get nervous because I'm hungry? I'm not going to die... even though I may feel like it. Slow down my thinking... I've got this. Think... what would be the best thing to eat right now? Why should I choose good food? Because I'm going to look fantastic in my skinny cloths! When I get stuck and can't find a good dinner, what is my escape plan? A power bar I can carry? What else? What do others do? What are my top barriers to getting in better shape? Dinner is killing me. I am starving and nothing sounds good except the bad stuff. Who can I ask for good, easy to make dinner ideas. Do my research here and do not settle until I find the perfect dinner rotation. Chocolate is the devil! I will talk to people until I find a replacement. Who can I team up with to walk with me? How about John or Karen? I'm going to let John know, that when I start freaking out he is going to get a call! I'm going to let him know how I want him to talk me through it. I commit to listening to his advice when I'm in those moments. He is the boss of my freak out moments. Not me! I need a physical activity. What are couple things I can do? Who can I team up with? You get the idea. Be creative. No... be Super Creative, with your brainstorming here. Squeeze out every thought that is in your head. By taking the steps above you have designed a 'solution mindset.' Once you have these details down, read your notes every day for the next three days. What else comes to mind? Write it down. Take these three days to let your thoughts work for you. The mind has a neat way of solving problems when we have the details in our head. When you get a great idea, get it on the list! During this review time, start to work on your commitment to take action. What day do you want to start on one, or all, of these things? Solutions will continue to come as you approach your kick off date. Get excited and when you get to the big day, go all in. You're worth it. Understanding the "want," is invalualbe to understanding how to get there. How Do You Get Focused?